Yes, Shakeology does taste good. I’m amazed how Beachbody was able to pack so much nutrition into Shakeology and make it taste so good. 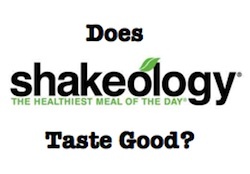 But the better question is what flavor of Shakeology tastes the best. With nine different Shakeology flavors to try you really need to taste all of them before saying whether or not Shakeology tastes good on a whole. Some people love one flavor and hate another. People have different taste buds so I’ll go over which flavors I think are the best followed by what other people have told me. Chocolate seems to be a crowd favorite. Greenberry doesn’t do so well because it doesn’t taste “green” or “berry”. You either like Greenberry or you don’t. The vegan flavors are lighter to the taste and are a little harder to get them right in the blender. I seem to make them watery. It’s best to buy the Shakeology sample packets to find the flavor for you. I found after using Shakeology for seven years I kind of enjoy all the flavors about the same. Chocolate and Vegan Chocolate taste the best to me but I look forward to having the occasional Greenberry or Tropical Strawberry to switch things up. There are recipes out there which make both of those taste very good. My body is at the point where it craves the nutrition in Shakeology over the taste right now anyways so it’s more about providing my body with the right kind of nutrition for the day.